Tell Me When It's Over is an interview series in which we ask former athletes about the moment they knew their playing days were over. 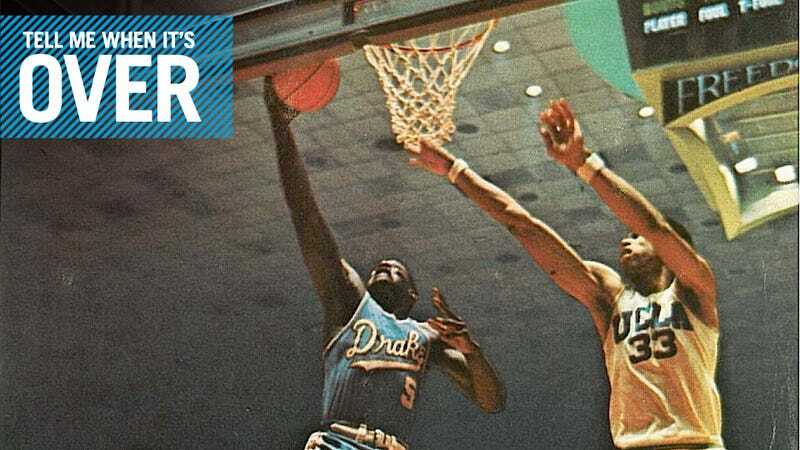 Today: Dolph Pulliam, defensive leader and emotional catalyst for the 1969 Drake Bulldogs. In Lew Alcindor's final season at UCLA, the Bruins won their third consecutive national championship. Their season record was 29-1; UCLA won by double digits 25 times. In the first two games of that year's NCAA tournament, they beat New Mexico State by 15 and Santa Clara by 38. But in the national semifinal, UCLA very nearly lost to a team making its NCAA tourney debut, Drake. It remains the Bulldogs' only Final Four appearance. John Wooden's UCLA team led Drake (coached by Maurice John and featuring Willie Wise, whom we met on Tuesday) by two points at halftime. A put-back by Pulliam in the game's final minute cut the Bruins' lead to one, but UCLA would go on to win, 85-82. The following night, Drake beat North Carolina by 20 in the consolation round. It was Pulliam's final basketball game, though he would later be drafted by the Boston Celtics in the sixth round. (He would also receive some interest from the Dallas Cowboys.) After graduation Pulliam stayed in Iowa, becoming the state's first African-American television broadcaster. He is a member of Drake basketball's All-Century team and his No. 5 jersey was retired in 2009. He now provides radio color commentary for Drake basketball games and serves as the university's director of community relations and development. I was born in West Point, Mississippi, and I was born before the Civil Rights laws were passed. We lived under the Jim Crow laws in Mississippi. And so I had no rights. My family, my brothers and sisters, my eight brothers and sisters, myself and my mom, we had no rights in Mississippi, and so we lived in fear of losing our lives there. But with my mom's help, we were able to get out of Mississippi. And my mom died after we left Mississippi and moved to southern Missouri, and then my mother's sister came and took us to Gary, Indiana. We lived in the inner city of Gary, and my aunt worked cleaning apartments for us to get some money. What my aunt had said was that she would work until the last one of us graduated from high school, and any of us that could go to college would go to college, and she said she would continue working until the last one of us would graduate. I was having some struggles. I was having some adjustments after the death of my mom, and I was a young kid and living in the inner city. I was more concerned about losing my life or getting beat up by the gangs and the drug pushers and all of that. And so I flunked the third grade, and after I failed the third grade, my aunt said to me, "Son, you've got to succeed. You've got to be a success." She said, "I want you to dream. I want you to dream big dreams." And that's when I started dreaming. That's when I started to dream. The moment I knew that my career was over was right after we had just lost to UCLA at Freedom Hall in Louisville, Kentucky. I knew at that point. We were crying in the dressing room. We were emotional because we felt that we should've won that ballgame. And I wanted to leave on a high note. I really wanted to win that game. But at that moment in time, the realization set into me, That's it. You're done. You know, you are finished. I'm sure I realized it, later on, that we would play the consolation game the next night, but for that moment after we had lost to UCLA, my mind had said, I'm resigned to the fact that my college career's over. And here's what my teammates said. Together in that dressing room, we said, We're not leaving here losers. We're going to beat somebody, and we're going to take it out on North Carolina. We are going to defeat them, and we're going to leave here with our heads held high. So, we did that. We beat North Carolina. We beat them by 20. And UCLA played Purdue, and UCLA beat Purdue by 20. The crowd, the UCLA fans were yelling, "Drake Number 2!" and the Drake fans were yelling, "We're 1 ½! We're 1 ½!" My dream was to finish college and then go off and play into the pros somewhere. But when I came back and had my first two calls from Tom Landry and Red Auerbach, my next call was from Procter & Gamble, and they wanted me to come to Omaha to be interviewed by them. I went to Omaha and interviewed with Procter & Gamble. I was interviewed by Westinghouse in Poughkeepsie, New York. I was interviewed by the Ford Motor Company in Detroit. I got a phone call from the chairman of the board in those days of Standard Oil, and he said he'd like to send his private plane to Des Moines, Iowa, and pick me up, and he wanted me to come to Chicago, have lunch with him, and he wanted to talk with me about working for Standard Oil. I did that. I went back to Des Moines. The governor of Iowa called me and he said, "I'm going to send my driver down to Drake, and I want you to get in that car and come on up here to the statehouse and I want to talk with you about working with me in state government." And so he did and I came up to the statehouse and I'm sitting there with the governor and I said, "Governor, what is this?" I said, "I wanted to go off and play with the Boston Celtics or the Dallas Cowboys, and I've been getting all of these interviews with companies that have offered me jobs. Governor, this is amazing, but what's going on?" And the governor said to me, "Dolph, have you been paying attention to what's happening to you?" And I said, "Well, no sir. I'm just playing basketball and trying to keep myself out of trouble." He said, "Son, who's the first guy at the basketball games, and who's in the student section and who's getting those kids all riled up for the game, and by the time it's game time, those kids are in a frenzy? You." He said, "Dolph, who's out there shaking hands with people and telling them, 'Welcome,' and, 'Thanks for coming to the ballgame,' and, 'We really need you tonight,' and, 'Help support us'? You." He said, "Who's out there after the ballgame, shaking hands with people and holding babies and signing autographs and taking pictures? You." He said, "Son, don't you realize what you were doing?" And I said, "Well, no sir. I was just thanking people for coming because we needed them." He said, "No, you were marketing Dolph Pulliam, and that's what these people saw in you." And I went, "Oooohhh." I never realized that. So then I got a phone call from my Coach John, and he said: "Dolph, get over to my office. I need to talk with you." So I did. And he said, "Dolph, some of the Des Moines business leaders want to take you to lunch." And he said, "So I want you to go put on a suit and tie, and I want you to go to lunch." And I said, "Coach, are you going to go with me?" He said, "No, no. You just go. They didn't invite me. They only wanted to meet with you." So I said, "OK, Coach." So I go to lunch, and there were Des Moines' founding citizens. There were the old families of Des Moines. It was old money of Des Moines who was sitting there with me. These were the city leaders, and they were saying to me, "Dolph, don't leave. We want you to stay here. The things that we see in you, we like. Dolph, we want you to stay in this community. We want you to be a part of this community, and we'll do whatever we can to help you. Won't you stay and not go play in the pros?" And with all of that, I made the decision. You know, these people really care. They really care. And I'm going to stay here. And I let my dreams go. So that's it. That's what I did. After I decided to stay, I decided, with the advice of my radio and television professor, to go out and interview with the local TV station and take that job. And so I did. I went down and did that. But one of the things that happened, because I thought I was a very popular basketball player and people liked me—but when I took that job and after I appeared on the air on Channel 8 for the first time, I didn't realize that I was the first African-American television broadcaster in the state of Iowa. So I had broken ground there. But I didn't realize that, when I went on the air, there were folks that were calling in to this television station, telling the television station to take me off the air, that they didn't want me coming into their living rooms, that they hated me. And then—the station didn't tell me this—the calls got worse. There were people calling the station and telling the station, "If you don't take him off, we're going to kill him." And that's when the station called me into the office. The station manager called me in. He said: "Dolph, people want to kill you. They said that they're going to kill you, and I have to bring the FBI in here for this meeting. I want them to hear this as well." And he said, "So Dolph, we know how we can get this to stop. We know that if we take you off the air and let you work behind the scenes, then all of the death threats will stop." He said, "But if you say that you want to remain on the air, then Dolph, we'll support you." And so I said, "I want to stay on the air. I don't want to get off the air." And they said, "Then we'll support you." And then the agents said, "Then we'll have to protect you until this stuff gets stopped. We have to search your routes to work and we've got to search your apartment and we've got to search your car for bombs, and we'll do this every day until we can get this, until this thing stops." And that's how my career began. I was scared to death and I thought, Hmm, maybe I made the wrong decision in wanting to do this [laughs], but I stuck it out. I had met a guy, this had been while I was playing at Drake, and he said to me, "If you ever need any help, you just call my office and tell them that you need to talk to me, and it's important." And that was the governor of the state of Iowa. And so I called his office and I spoke to his secretary and I said, "It's important. I have an emergency and I need to talk to the governor immediately." And so she went away and came back to the phone and she said, "Dolph, the governor said you need to leave the station now. You get in your car. You drive up to the statehouse and you park your car right behind the governor's car at the state house and somebody will meet you and bring you in." And so they did that, and the governor and I sat there and talked, and I told the governor what was going on, and he thought for a moment and he said: "Dolph, now I understand. They don't know you like I know you." And he said, "So what I'm going to do is: You'll be getting calls from my staff, and they'll tell you to meet me a certain location, or meet me at the airport, and I'm going to take you with me around the state of Iowa, and I'm going to have you onstage and you introduce me, and then when I get onstage I'm going to talk about you, and then I'll do my business and that's what will happen." We started doing that and the death threats stopped. They stopped. And later I asked the governor what had happened, and he said, "I just wanted the people that were doing this in the state to know that if something ever happened to you, this governor would not be very happy." Drake University is my surrogate mother. I love her. I love her like I love my own mom. I get emotional when I talk about her. She took a chance on me. She took a chance on a little kid coming out of the inner city of Gary, Indiana, to bring me to this prestigious university. And it's a very difficult university to get in, and a very difficult university to stay in. But Drake said that if you come here, we're going to help you. It's not going to be easy, but we will help you. If you need help, we will be there. So she taught me, she acclimated me to this environment, she nurtured me. Drake University educated me and made me the man that I am today. I am forever, ever dedicated and loyal to her. I love this university. Last year Rob Trucks interviewed current and former D-I basketball coaches Jay Wright, Mike Adras, Charles E. Ramsey, and Kevin Stallings as part of his oral history of 49-year-olds. His other work for Deadspin includes interviews with former NHL goalie Clint Malarchuk and the late Dave Duerson, and an oral history of Big Star co-founder Alex Chilton's time in Tuscaloosa. You may e-mail him at trucks@deadspin.com or follow him on Twitter at @tusktusktusk.